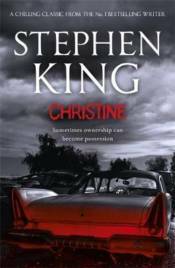 Hodder are boosting Stephen King's backlist with new covers, new author brand lettering and a marketing campaign which directs readers to the right King title for them.A supernatural tale about girlfriends, boyfriends and a car called Christine.Christine was eating into his mind, burrowing into his unconscious.Christine, blood-red, fat, and finned, was twenty. Her promise lay all in her past. Greedy and big, she was Arnie's obsession, a '58 Plymouth Fury. Broken down but not finished.There was still power in her - a frightening power that leaked like sump oil, staining and corrupting. A malign power that corroded the mind and turned ownership into Possession. About The AuthorStephen King has been described by the Guardian as 'one of the greatest storytellers of our time', by the Mirror as a 'genius' and by The Sunday Times as 'one of the most fertile storytellers of the modern novel.' In 2003, he was given the National Book Foundation Medal for Distinguished Contribution to American Letters. He lives with his wife, the novelist Tabitha King, for most of the year in Maine, USA.